There are a lot of different investment options out there. In this section, we will review two of the most common: equities and fixed income. Asset—an asset is something that can be purchased and has a monetary value. Asset Class—an asset class is a group of securities that have similar characteristics. Equities—securities which represent ownership of a company, partnership, or trust. Fixed Income—securities in which income is generated regularly or semi-regularly. Security—a security is a tradeable financial asset. Volatility—our measure of risk, typically the annualized standard deviation of a security’s return. Ownership in a company, partnership, or trust is divided into shares, or stock. For public companies, these are typically traded on exchanges or through brokers, making it easy for investors to buy and sell them. In the United States, most stocks are listed on the New York Stock Exchange (NYSE) or NASDAQ. What makes equities is a great investment is that they offer the greatest growth potential to long-term investors. They also carry a variety of risks, which is why it is important to consider your needs and goals before making a decision on what to invest in. Buying fixed income securities, like bonds, gives investors a relatively secure stream of income. Corporations, municipalities, governments, and other entities issue bonds to investors in order to borrow money. In return, they pay these investors interest. Bonds and other fixed income securities are seen as more stable in their value, though as with any investment, there are still risks involved. For those who need a short-term investment, income producing assets, or conservative investors, fixed income is a great building block for investors. Major risks to fixed income are somewhat different than the risks in equities, which is why it is important to consider their role in your portfolio. Different investments offer different returns. It is important for investors to be aware of the risks and returns offered by any potential investment and evaluate them within the context of their needs and goals. 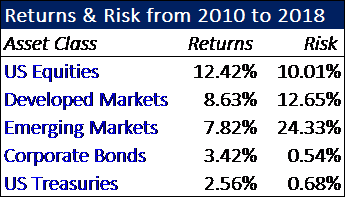 Another step to take is to think about the risk and return of your holistic portfolio, and to optimize your strategy to highest return for the amount of risk you are willing to take. Learn about our investment approach and how we work with clients to protect and grow their wealth. Talk to us to find out more.